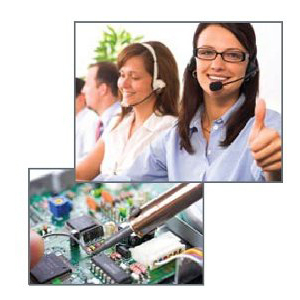 Service Made Simple is Honeywell’s affordable solution for customers who require easy, hassle-free repair service for their handheld, hands-free and bioptic scanners, as well as mobile computers. Service Made Simple helps customers ensure their data capture devices are running at peak performance. Available in three or five-year programs, Service Made Simple assures quality repair service, conducted by qualified Honeywell technicians. And just as important, it’s fast. Hand-held, hands-free and bioptic products will be serviced in one business day, mobility products will be serviced in three business days, and all will be returned to your site via expedited delivery. Devices covered for normal wear and tear or accidental breakage. Devices with a three-year warranty or less begin with a three-year Service Made Simple package, and those with a five-year warranty begin with a five-year package. Mobile computers received will be serviced in three days and shipped back via expedited delivery. Devices will receive any pending engineering changes such as firmware upgrades during the repair process at no cost. Note: Service made Simple Service contracts must be purchased within 30 days of device purchase.